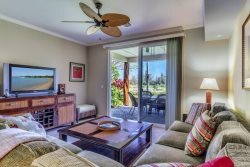 D101 Vista Waikoloa is an amazing two bedroom, two bathroom vacation villa, and is the perfect getaway for friends and family sleeping up to six guests. A spacious living room is inviting and features a large L-shaped sofa, a large flat screen TV, and access to a covered lanai that offers designer patio furnishings and a dining table with seats for four. Tropical garden views during the day, and star gazing during the tropical evenings is not to be missed. Open and inviting, the living room open to a gourmet kitchen which comes fully-equipped with stainless-steel appliances and a beautiful dining table with seats for six. Vista Waikoloa has a heated a salt water pool and hot tub for your year round enjoyment. A luxurious master suite features hardwood floors, access to the covered lanai and an en-suite bathroom with an extra large walk-in shower. The guest suite offers two double beds and is close to the main bathroom. For extra guests there is a sofa sleeper in the living room. Also included is; basic cookware, dishware, drink ware, coffee maker, blender, washer/dryer, hairdryer, bed and bath linens, iron, air-conditioning, wireless service, basic cable TV. There are beach towels for your use. Waikoloa Beach Resort is a pedestrian friendly resort with 2 outdoor shopping centers, Queens’ MarketPlace and Kings’ Shops, Hilton Waikoloa (directly across the street) and Waikoloa Beach Marriott and Anaeho'omalu Bay (A-Bay) – all within walking distance of the condo. Enjoy the white sand beach of Anaeho'omalu Bay is about a 15-minute walk away which offers many water-sports from this picturesque beach along with the very popular restaurant Lava Lava Beach Club. Water sports include windsurfing, swimming, sailing, snorkeling, glass-bottom boat, dive trips, whale watching trips, etc. When we discovered we left our phone at the property after checking out, your team was very attentive and great in helping us get our phone and accessories shipped back to our home. Thank you again for your assistance and your house clean staff!! See you again in the future!! ****From ResorticaHawaii.com Management, thank you so much for the great review! We are so happy you enjoyed your stay! We really enjoyed our stay at your property. It had all the amenities we needed and provided the comfort of home we needed for our family.